In this world of “having it all,” it can be a hard to remember that we can’t, in fact, have it all. At least, we can’t have it all at the same time. And that’s okay. But it is not okay is when your actions don’t align with your beliefs. I’ve been struggling since I stopped working for Military.com. All that time that was supposed to get redirected into my other clients has been redirected into other stuff, like actually finishing our taxes before October, and attending to some medical needs that I have been putting off for years, and maybe actually unpacking those last few boxes. (Say THAT isn’t so!) And, driving kids and hanging out with kids and occasionally seeing my Mom and generally living a life of leisure, but without the bonbons. Very little extra “work” has happened, and I feel guilty and frustrated and kinda worthless. As I ruminated over several days of “not getting anything done” because I was doing family things instead of work things, I had an interesting lightbulb moment. In the big picture, as much as I love helping people with their financial challenges, I love my kids and my husband and the rest of my family more. Rather than measure the value of my day based on how much work I accomplish, I should measure the value of my day in how much parenting, wife-ing, family-ing, and friend-ing I accomplish. Yes, work is important, but it is not THE thing by which I should be defining my life. Because when it comes right down to it, I value my kids and my husband and my extended family and my friends more than I value my work. Modern life is really hard on everyone. Both men and women are being told that they should be able to work full time, be an active, involved parent, and somehow magically share equally in the enormous myriad of things that go into managing a house and a household. Buying into this myth creates a crazy amount of pressure, and a lot of negative feelings when being super-person doesn’t work out. For the first few decades of the “having it all” revolution, military spouses seemed to have a pass. How could you possibly hold down a career while moving every 3 years and solo parenting? Let’s be clear: spousal employment expectations were low. When my husband and I were newlyweds, it was unusual for military spouses to have a career. In his first command, there were two spouses who had full-fledged jobs, and they were definitely outliers. In the last last 10-15 years, there has been a huge push to improve employment opportunities for military spouses. We have federal programs like Hiring our Heroes Military Spouse Professional Network, private organizations like the Military Spouse JD Network, and companies like Mad Skills, who hook up military spouses with employers. It’s fantastic that we’re overcoming some of the hurdles for military spouses who want to work, but it is also a little worrying. 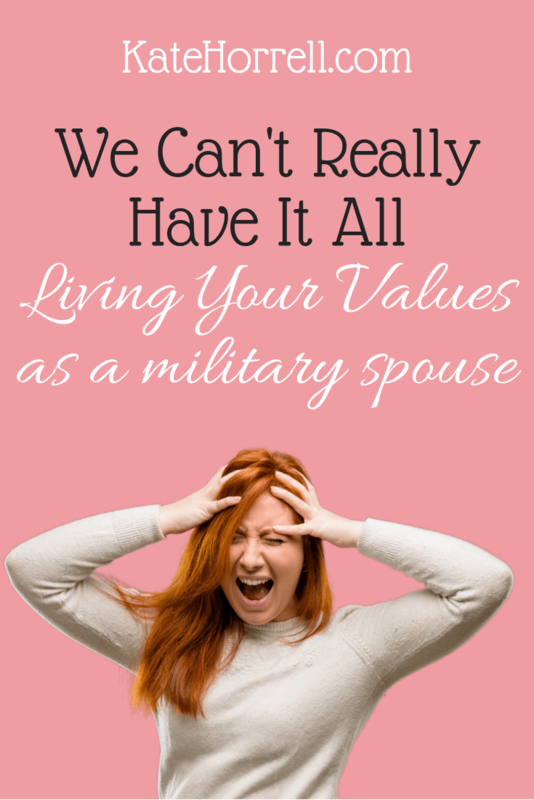 The constant conversation about military spouse employment is, in some cases, making military spouses feel that they don’t have value if they’re not working. Again, this isn’t an issue unique to the military – non-military folks struggle with their choices, too. But non-military folks don’t have a barrage of “spouse employment” studies and laws and programs telling them that there’s a problem. My civilian friends don’t feel the need to justify why one partner doesn’t work, or works part-time, or works at a job that isn’t commensurate with their experience – they just recognize that being a two-full-time job family doesn’t work for everyone. In the enthusiasm to improve employment opportunities for military spouses, let’s be sure that we’re not inadvertently telling military spouses that they don’t matter if they’re not employed. So, how do you figure out what you really value? Best-selling author and generally smart guy David Bach tells readers to create their Value Circle™ to align their spending with their values. (You can find the exercise in this free download, though I strongly recommend ANY of his awesome books. They have literally changed my life.) The same idea applies to time: Does the way you spend your time line up with your values? Obviously, life isn’t so simple that we can just drop everything and live our dream everyday. Bills need to be paid, yards need to be mowed, and kids need to go to school. Even so, it’s important to respect your values when you make the big and little decisions that shape your life. If you’ve identified that spending time with your kids is one of your top 5 priorities, then maybe you choose to live in a smaller house so you don’t have to work 60 hours a week, or maybe you decide that it is OK if your floors don’t get vacuumed as often as you think they should. Alternately, maybe your job is super-important to you, and you’re willing to sacrifice a social life for more hours at the office, or hire someone to mow that yard. There’s no right answer, but there might be a right answer for you. What’s important is that you recognize the fact that you can’t do everything, and you’re actively choosing to do the things that matter to you right now. Don’t buy into the societal hype that you need to do everything, because you can’t, and you’ll just make yourself (and everyone around you) miserable if you try. In case you were wondering, the other book that changed my life was Your Money Or Your Life. It’s been updated this year and is still one of the top three books I recommend folks read, along with I Will Teach You To Be Rich. My wife retired after we started having kids, her choice which I supported, and has never gone back to a career. I early retired later and joined her. We are both happy and our grown millennial kids are successful in no small part due to her ability to focus on them in their early years. We were and are a team of equals with great respect and affection for each other. Not working is a valid choice for either spouse if it is economically feasible and leads to fulfillment for both partners. Great points, Kate. By trying to “fix a problem,” we may be inadvertently creating one. There’s enough pressure on military spouses these days to be the best at everything. Chart your own course and don’t listen to the marketing and advertising, even if it’s supposedly for your benefit!